Even though it’s already the middle of March, it still feels like winter in Idaho! Since the snow was coming down today, I decided to capitalize on more comfort food cooking before spring arrives. This easy yet delicious chili recipe doesn’t include any “fancy” ingredients so you can probably use what you have lying around in your cupboards already! It’s sure to be a crowd pleaser! 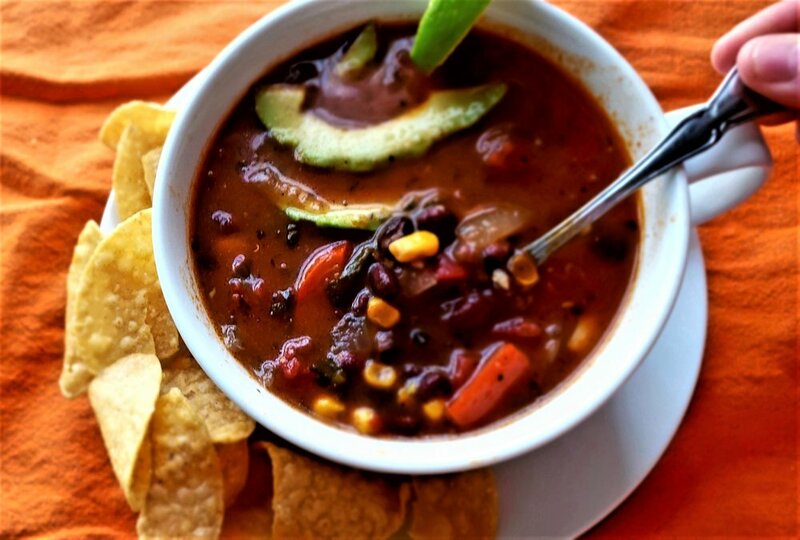 Plus, it’s packed with protein and fiber from black beans, pinto beans, and kidney (red) beans. 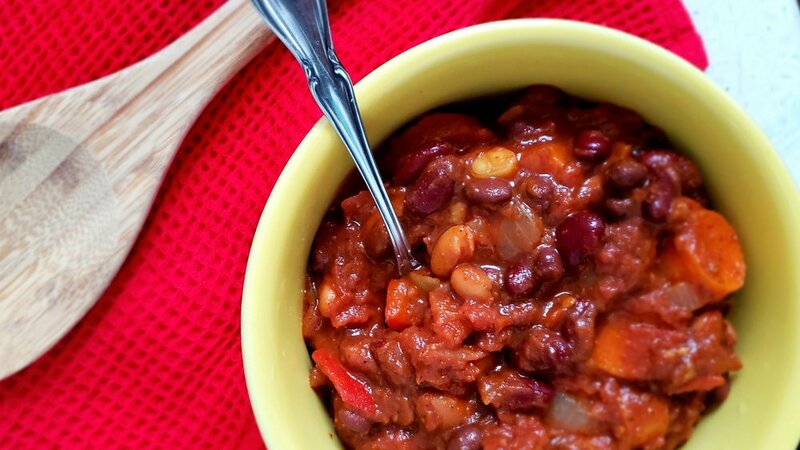 The key to a savory, just slightly sweet chili is the addition of cinnamon to this recipe. This chili is vegan as is, but feel free to add any toppings you desire, such as avocado, shredded cheese, or sour cream. I served it with cornbread. Prep your veggies: Wash, peel, and chop carrots into roughly ¼” rounds (discard the root and stem tips). Wash and dice the bell pepper into square-like pieces (remove seeds and inner core). Peel and chop the onion. Peel and mince the garlic cloves. Heat oil over high heat in a large soup pot. Add the carrots, bell pepper, onion, and ¼ teaspoon of salt and sauté 6-8 minutes until onions are translucent and veggies are softened slightly. Add the minced garlic, cumin, chili powder, paprika, cinnamon, remaining salt, and sprinkle with black pepper. Coat well and stir to combine. Add the beans, crushed tomatoes, and diced tomatoes. Add 1 cup of water, stir, and bring to a boil. Reduce heat to medium-low, cover, and simmer for 35-40 minutes or until carrots are sufficiently softened and chili is aromatic. Spoon into bowls and add your toppings or serve with cornbread. Enjoy! This recipe a culmination of some of my favorite lentil soup recipes, and I added a good bit of lemon and kick of curry to give it something extra special. I just love lentils - loaded with protein and fiber, they make a very filling meal and can be added to a variety of soups, salads, and wraps. This soup uses the juice of half a lemon, but feel free to give it an extra squeeze with a lemon wedge just prior to serving for an extra lemony flavor. It also calls for topping with chopped fresh cilantro - this isn't just a garnish but adds more flavor, so don't skip this step! Saute onions for 3 minutes or until translucent and fragrant, then add carrots and celery and saute for another 3-4 minutes, or until softened. Add lemon juice, broth, and lentils and bring to a boil. Reduce heat, cover and simmer 20 minutes or until lentils are cooked (they should be chewy and soft, but not mushy). Serve in individual bowls topped with cilantro and an extra lemon wedge for garnish. 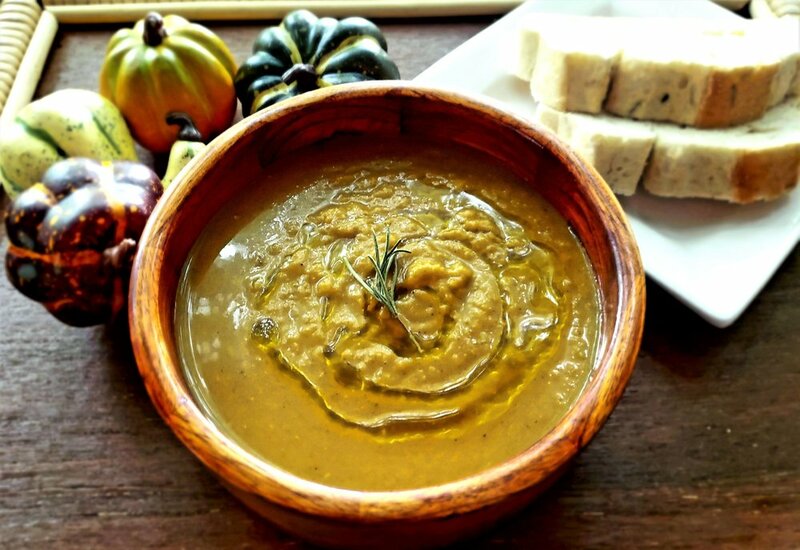 This soup also goes great with warmed pita bread! The rain was drumming softly on the roof the other night and the leaves have started to turn their brilliant fall colors, so I thought this would be a perfect night to whip up one of my favorite homemade tomato soups. 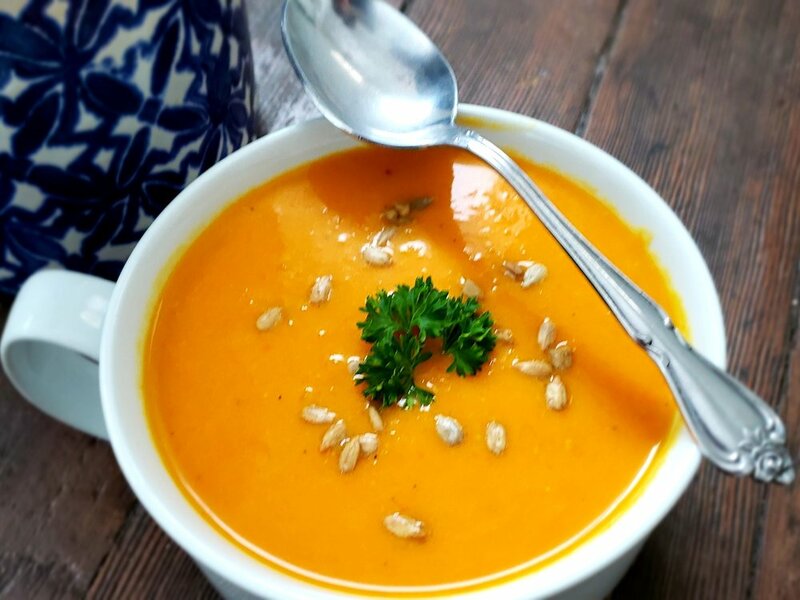 This soup is perfect for cold days, but one of the reasons I love it is because it's so EASY and takes under 45 minutes to make, which is a huge plus for me and my hectic schedule. This soup is wonderful with sourdough toast or grilled cheese sandwiches. In a large (3-4 quart) saucepan, heat the olive oil over medium heat. Chop the onions and add to saucepan, sautéing gently until translucent and fragrant (about 5 minutes). Add the garlic and heat for 1 minute, being careful not to burn. Add the canned tomatoes, salt, pepper, sugar, and basil. Stir all together well. Add the vegetable stock and tomato paste and cover, simmering on low for 15-20 minutes. Remove from heat and stir in the half and half or soymilk. Using a handheld immersion blender, gently puree the soup. You can also transfer the soup in batches and puree in a blender. Serve topped with additional basil or Parmesan cheese. *I always use Better than Bouillon (either the "no chicken" vegetarian bouillon or the vegetable bouillon) for all my soups rather than vegetable broth. I find that it provides a much more savory flavor that is needed for vegetarian soups. Simply mix 1 tsp. bouillon with 1 cup water and boil.